A custom logo design is the most crucial yet frequently overlooked element of new business marketing campaigns. Neglecting your business logo can have devastating consequences on the success of your business. It is the central icon of your entire company; it is attached to everything your customers and potential customers see. It may seem trivial to some, but the logo is your silent ambassadors the face of your business. Here at Shazam Designs, our logo designers know the significance of a solid, unique, and easily-identifiable custom logo design. Whether you are an established business looking to rebrand, or a new business that wants to break into a particular market or venue, our logo designers can create the most effective logo for your company. Why custom logo designs are important? In the consumer’s eye, your company logo is the element that differentiates your product from another. Custom logo designs communicate the values and purpose of your company. To consumers, well-designed company logos communicate the legitimacy and professionalism of a company. 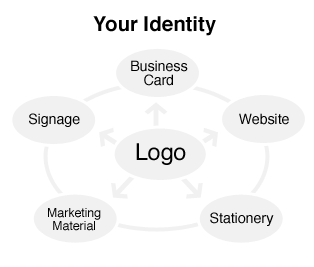 Our logo designers use a systematic and proven process when creating business logos. Its a team effort between designer and client. After we research your industry and current style trends, we conceptualize and sketch initial ideas. During this stage, we present you with the best 3 logo concepts. You then review these 3 selections and provide feedback. Using your feedback, we modify and further develop the chosen logo. Changes included modifications to symbol, color, and positioning. Now you choose your final logo! This is the end of the logo design process and we will submit all logo files to you contained in a portfolio. Can consumers really fall in Love with my custom logo design? Yes! This is indeed true. Consumers can become fanatical and very emotionally attached to a brand and its logo. Our logo designers take this emotional connection very seriously. When we create custom logo designs, we know we aren’t just creating a design; we’re producing something that consumers will connect with and even cherish. This is why you need your business logo to be designed by a Shazam logo designer Brisbane consumers are just waiting to fall in love with your brand. What is an effective logo? A custom logo design should be simple and easy for a customer to remember. Our professional logo designers will create a business logo that reflects the values and purpose of your company. Your logo must be memorable and recognizable. We make logos that are distinctive and clear so that your customers can easily recognize and form an emotional attachment to your logo. Its impact needs to last. Think of famous business logos that have withstood the test of time this is what you need! With the help of a Shazam logo designer, Brisbane will always remember your company. Your custom logo design needs to be appropriate for all your marketing materials. A logo should be appropriate for its intended purpose – marketing, branding, and emotional identification. With the help of a professional logo designer, Brisbane will come to know and love the face of your company. – Illustrative-either concrete or abstract. These types of logos use type fonts to incorporate your company brand name. There are literally thousands of possible variations, shapes, sizes and styles of type fonts. Each type will convey a different impression on the audience. Legibility and recognition are important, especially when reduced to the size necessary for business cards. These types of logos are very elaborate, and are considered the best option if you are trying to establish a brand in a highly competitive market. Illustrative logos are clever and contain intricate details that are intended to impress the viewer. This type of lot is complicated enough for customers to recognize yet simple enough for replication. Abstract logos are characterized by limited colors and high contrast. These are the easiest type of logo for consumers to recognize and require less emotional attachment to have an impact. The size is dependent upon the promotional needs of your company. These logos are very adaptable; looking just as excellent on stationary as they would on a billboard. custom logo design unforgettable and irresistible! Contact us today.